A 28-acre wetland in New Hampshire that is home to a community of Atlantic white cedar trees and a rare species of orchid has been conserved in perpetuity. Efforts began in the late 1970s to protect the land, which is two miles south of Portsmouth. The Seacoast Land Trust and the City of Portsmouth will jointly protect the land and adjacent forestland. The project will add to the more than 200 acres already protected near the wetland, said Danna Truslow, who served as executive director of Seacoast Land Trust until earlier this year. She said the trust will continue work to protect more open space in the area. A parcel of 15 acres on Berry's Brook, about half a mile downstream of the wetland, was recently donated by the Ciborowski family to the Trust. Bernard Maxam, who owned the 28-acre wetland, offered it to Seacoast Land Trust for a price well under fair market value. The New Hampshire Coastal Program contributed $45,000, the Fuller Foundation $5,000, the City of Portsmouth $25,000 and private donors more than $10,000. The city will own the land and the Trust will hold a conservation easement on the property. For more information see www.seacoastlandtrust.org. "What do we want our community to look like in 50 years?" Sprawl and its impact on the environment has been a major issue in Maine. House Majority Leader Glenn Cummings is sponsoring a $50-million rural development bond issue that will be considered in 2006 and will include training local officials to make decisions about using open space. The Beginning with Habitat program could help by providing towns and land trusts with the information necessary to make decisions on how land will be used. The information includes rare plants and animals in a specific area, important habitats, riparian areas and undeveloped blocks of habitats in Maine. The program originated in the mid-1990s with the University of Maine's Cooperative Fish and Wildlife Research Unit under the direction of Maine's Department of Inland Fisheries and Wildlife. In 2000, an interagency partnership was formed including the Maine State Planning Office, Maine Audubon Society, Wells National Estuarine Research Reserve and the U.S. Fish and Wildlife Service. Beginning with Habitat provides a booklet, habitat maps, species descriptions and guidance to local communities to help integrate biodiversity and protection and habitat conservation into land-use plans. One of the three main areas of focus is riparian habitat, or the transitional zone between aquatic habitats and wetlands and dry or upland areas such as the banks of streams, rivers and lakes. Towns can protect a lot of riparian habitat by enforcing Maine's Shoreland Zoning provisions, which include a 75-foot buffer around second-order and larger streams and a 250-foot buffer around rivers, lakes, ponds and non-forested wetlands larger than 10 acres. The second area of focus is high value plant and animal habitats that can be home to deer, heron rookeries, nesting seabirds and rare animals. Some of this habitat already is protected to some degree under state law, but may need further local protection. The third area is large habitat blocks, which provide homes to certain plants and animals not included in the other two habitat areas. They are especially important to species with large home ranges such as bobcat, and other species like the black-throated blue warbler, which may only live successfully in these larger habitats. For more information see www.beginningwithhabitat.org. New England and the Maritime Provinces tells the story of smugglers, fishermen, Paleo-Indians, settlers, soldiers and others in the diverse region over the last 10,000 years through a series of essays by scholars on both sides of the border. Associate Professor William Wicken at York University in Toronto examines what the division of the land into two regions means to groups like the Passamaquoddy, whose territory has straddled both sides. One question he addresses is whether the Indians can maintain a political and cultural identity above and beyond the unique identities created by the two countries. The French settlers of Madawaska, which lies along the St. John River, were also affected strongly by border disputes. Associate Professor Beatrice Craig of the University of Ottawa writes about these people and how they had to acclimate themselves to a dramatically different culture when they became citizens of Maine. Origins of the tensions between locals and natives, a topic that remains an issue even today, is described by University of Maine Professor Richard Judd and University of New Brunswick Associate History Professor Bill Parenteau. Other essays cover the Bay of Fundy area as one of the great smuggling centers of the Atlantic world, and how in the early 19th Century people from politicians to farmers engaged in the trade; tension as Irish Catholics immigrated through the region during the famine; and interaction between Acadian settlers and English soldiers in the St. John Valley. The book was compiled after a conference in 2000 held by the University of Maine's Canadian-American Center. The book was co-edited by Stephen Hornsby, director of the center, and is available through the McGill-Queens University Press. For more information see www.umaine.edu/canam/. Five species of deep-water fish in the Atlantic are on the brink of extinction from overfishing, say researchers at Memorial University in St. John's, Newfoundland. They estimate that if current fishing levels continue, more than 99 percent of these fish will be gone three generations from now. Three generations is the benchmark for determining endangered species used by the international conservation organization, The World Conservation Union (IUCN), which publishes the "Red List" of threatened species. Populations have fallen so fast that the five fish species should be classified as critically endangered now. 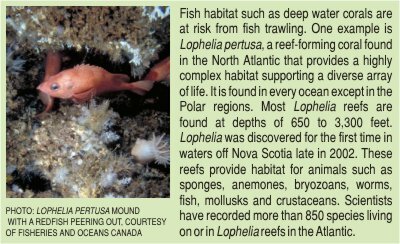 That's according to Jennifer Devine, a fisheries scientist at Memorial University, and her colleagues, who detailed the problem in the January 5 issue of the journal Nature. 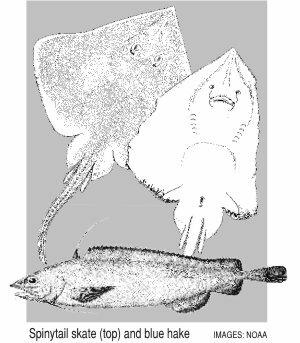 The five fish are the roundnose grenadier, onion-eyed grenadier, blue hake, spiny eel and spinytail skate. In studying records during the 17 years from 1978 to 1994, the researchers found that the numbers of the five fish in Canadian waters dropped by 89 to 98 percent. The fish grow slowly and live for 60 years. They don't reach sexual maturity until their late teens, making them especially vulnerable to overfishing, according to Devine. After the collapse of fisheries such as the cod, some fleets switched to deep-sea fisheries in the 1970s, but those eventually collapsed as well. The five in-danger fish now are caught mostly as bycatch. The researchers called for immediate action to relieve the pressure on the fish. For more information contact Jennifer Devine at Memorial University at jdevine@mun.ca. A new remote sensor system makes it possible to examine fish populations in more detail and tell whether they are declining. The system can track large fish populations or small schools of fish over a 10,000-square-kilometer area, much larger than the 100 square meters that can be covered by conventional technology. Researchers at the Massachusetts Institute of Technology, Northeastern University in Boston and the Naval Research Laboratory developed the system. �We're able to see for the first time what a large group of fish looks like," said MIT Associate Professor Nicholas Makris. He compared the improvement in what scientists can now see to the difference between seeing everything on a television screen and seeing only one pixel or dot. The new system was described in the February 3 issue of the journal Science. The sensor system, according to Makris, could help government agencies to discern what is happening to fish populations, which many environmentalists and scientists say are in rapid decline because of overfishing. Adding to the lack of knowledge of what's happening under the ocean is inaccurate fish counts, which happen because the ocean is so dark. Existing surveying methods are too slow, he contends, because they depend on localized observations taken from research vessels. That can only provide a small amount of information about a large population of fish. While both the existing and the new method rely on sonar, the old technique involves vessels sending high-frequency sonar beams into the ocean, where they spread out like light from a flashlight spreading into a dark room. The new system uses low-frequency sonar that can travel greater distances and return information. The sonar essentially lights up large areas of the ocean about a million times larger than could be previously studied. And the images can be updated every minute. The new system works best along the continental shelf, and has been tested in the waters south of Long Island, New York. The MIT scientists say this is the first time it has been possible to see the patterns formed by large fish populations. One observation they made is that fish often congregate in an hourglass pattern. The research was funded by the Office of Naval Research, the Alfred P. Sloan Foundation and the National Oceanographic Partnership Program. It also is contributing to the Census of Marine Life (see Surprising Species Diversity Revealed). The groundfish trawling industry needs to take measures soon to conserve the complex habitat of the Gulf of Maine sea floor, or there is little chance that the fishery will recover to the levels of 50 to 100 years ago, University of Maine researchers say. University of Maine marine science Professor Les Watling and graduate student Emily Knight, in collaboration with Maine trawler captain Cameron McLellan and the Gulf of Maine Research Institute, recently completed a long-term study examining the effects of groundfish on the ecology of the sea floor in the Gulf. Watling also estimates it will take about a decade for the surface-dwelling organisms to reestablish themselves, and full recovery of the habitat will take much longer. That's based on the gradual increases in complexity and diversity seen in seafloor communities protected from trawling for two, four and six years. For more information see www.umit.maine.edu/trawling/.